I've been working sporadically on projects, trying to finish up things I started over the past year. 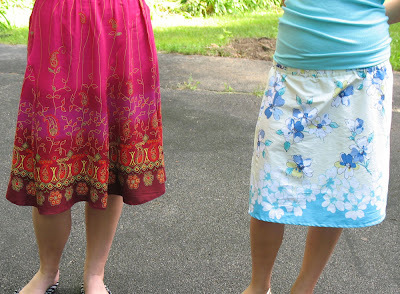 Here are skirts I finished for my girls... I know, they're wrinkled... it was a long day. 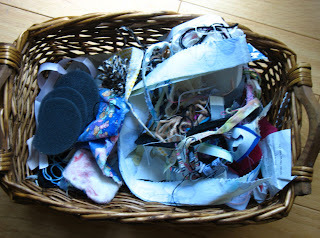 I'm thinking of a challenge to start in a month or so - when I was cleaning up my room, I sorted all my recycling off the floor and threw the rest of my fabric scraps, odds-and-ends into a basket. Then I started thinking it would be pretty creative to make something with all of this... anyone else interested? Start saving all your scraps, your threads, etc. What do you think? My daughter beside me right now doesn't believe that other people even have things like this on their floor - even if you don't want to join in a challenge like this, I'd love to hear from people out there reassuring me that I'm not the only one who throws things all over the floor when they're working on a project! I think there's packaging, fusible web, selvages, yarn, etc. in this basket. Since I started using it, my floor is remarkably cleaner, too. I'm going to let this simmer in the back of my head for a while and see what feedback I get. Sounds like if there will be a challenge, everyone will have to start their "trash" saving now and I'll post more about this idea in the future. Going to work on a bracelet now, just heard that one sold locally, so am motivated to complete some of the ones I cut out a few weeks ago. Is my font changing color? What's going on here? Also, I love your comments!!! Thank you for the feedback I've been getting, I've been trying to get to everyone's blog or email replies to them. I really appreciate the time you take to leave me a message and will post more as my projects progress, I know a bunch of you wanted to find out about my embroidered heart teaser. My floor looks just like that! I HAVE to keep it all!! I started sewing very recently, and when my grandmother heard about this, aside from teaching em how to sew, gave me a box just like yours :) She put there all the fabric left overs, yarn, elastic bands, some embroidery bits and lots of things I didn't get to properly sort out. it sounds like a fun challenge. I'd love to know more! i'm all for it! i like the idea of just having a basket sitting there to collect odds and ends. i always feel so guilty about throwing away even the tiniest of scraps. i think maybe even after you do this challenge, i might continue to challenge myself with that! clean out the basket as it gets full and see what i come up with. fun!! awesome idea! I have a ton of scraps. Mostly I cut them into 2.5 inch squares & make 9 patch blocks out of them. The more scraps the better. I've made 2 scrap quilts like that & could make many more. It's also a great way to use "ugly" fabric. I have old thread still on spools in a big glass jar on the livering room table. Adds color & can start conversations. I save long treads in a ziplock bag. I will use some in the bottom of glass vases for color & the rest I will put outside in a bird feeder to be used in nest making. I tried this with thin fabric pieces but they were too big. Hopefully the treads will work. Sounds like a fun challenge! I'm always saving things, but never able to think of good craft projects for them - let me know if you think of anything!